Not many composers or musicians have influenced the entire music scene like Italian composer Ennio Morricone. Many musicians say they got inspired by the music of the hundreds of movie scores the 86-year old wrote in his life. The revolutionary music for the famous Sergio Leone Westerns in the sixties, where he used instruments like guitars, harmonicas and church bells which were not common in orchestras, changed the business for ever. His My Life In Music tour to celebrate his musical heritage of over 50 years got interrupted because of a hernia. It left us in doubt if he would ever be able to do the concert in Amsterdam, that got postponed three times. But fortunately tonight it will finally happen. The maestro is performing with the 86-strong Czech National Symphony Orchestra and the polyphonic Debrecen Kodaly Choir from Hungary with 76 singers. Needless to say they need a big stage and plenty of seating so the as good as sold out Ziggo Dome is a fitting place. The orchestra, choir members and Morricone himself get a big reception when they take the stage and start to play the 'The Untouchables' theme. What follows is an overview of his most famous compositions, themes from movies like 'Once Upon A Time In America' and 'Le Clan Des Siciliens (The Sicilian Clan)'. They are grouped together in suites, where the pieces, although from different scores, are played back to back. It gives the orchestra room to stay focused, but the pieces also have something in common in terms of orchestration and feel. The ones at the start of the second set for instance are all compositions with mainly string arrangements. It gives the performance a good cohesion and balance. The highlight of the show is when his most revolutionary compositions from the Sergio Leone movies are performed. It is wonderful to hear the orchestra and choir perform 'The Good The Bad And The Ugly', which has never sounded more alive. 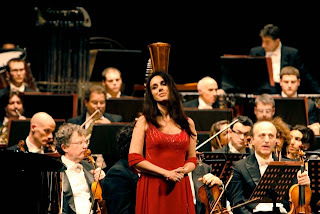 Morricone leads soprano Susanna Rigacci on stage and we all know what's coming next. People respond with excitement when they hear 'Once Upon A Time In The West' swell out. When Rigacci starts to sing the famous wordless vocals, it leaves everyone breathless. It is followed by 'A Fistful of Dynamite' and the set closes with 'The Ecstasy Of Gold'. It has never been so quiet in this big venue where everyone is listening in awe. A standing ovation leads us into the short break. Big screens at the side of the stage show close up images of the musicians and singers. But the camera shots are quite messy and unstructured, which is too bad. Better camera work and directing would have made the experience better for people that are sitting farther away from the stage or without the best view. Fortunately we have seats in the first ring and can oversee all of the stage and every musician fine. Morricone looks quite fit for someone his age who had to recover from a hernia. Once and a while in between suites when he's turning around to receive applause from the audience, he's leaning on the back of his chair, but other than that he's looking in good shape fortunately. At the end of the show the maestro and musicians are receiving one standing ovation after another. Rigacci is greeted on stage one more time as well and the show closes with a second exuberant performance of 'The Ecstasy Of Gold' where the orchestra and choir can shine one more time. It ends this wonderful evening in style, which is probably the last chance for me to see this legend on stage, truly one of the most important and influential composers of the past century.